Tottenham Hotspur midfielder Mousa Dembele has been banned for six games by the Football Association after he was captured of trying to scratch the eye of Chelsea’s Diego Costa. The match between Tottenham Hotspur and Chelsea on Monday ended in a bad blood. The score remain leveled (2-2) but spectators have witnessed a rough patch from both the team during the match. 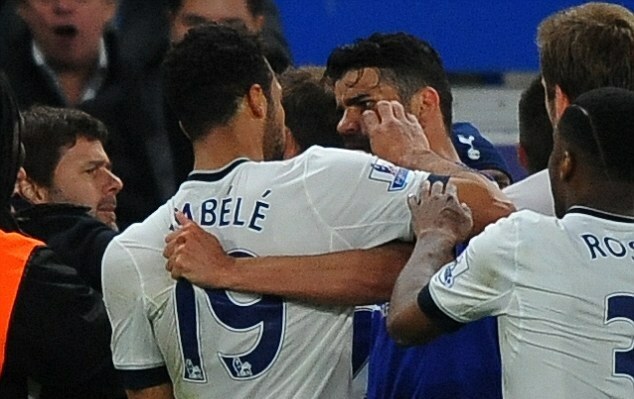 Among all the violent conducts the Tottenham Hotspur midfielder was caught on camera pushing his finger into Costa’s eye. The referee, Mark Clattenburg, did not see the incident, which came during a scuffle at the end of the first half. Tottenham Hotspur midfielder accepted a charge of violent conduct after he appeared to try to scratch the eye of Chelsea’s Diego Costa. An FA statement on Friday afternoon said: “Mousa Dembele will serve a six-match suspension with immediate effect after he committed an act of violent conduct which was not seen by the match officials but caught on video. “The Tottenham Hotspur midfielder accepted the charge but denied The FA’s claim that the standard punishment of three matches which would otherwise apply to this offence was clearly insufficient. “An Independent Regulatory Commission upheld The FA’s claim at a hearing today ( 6 May 2016) and ordered that an additional three match suspension was appropriate.